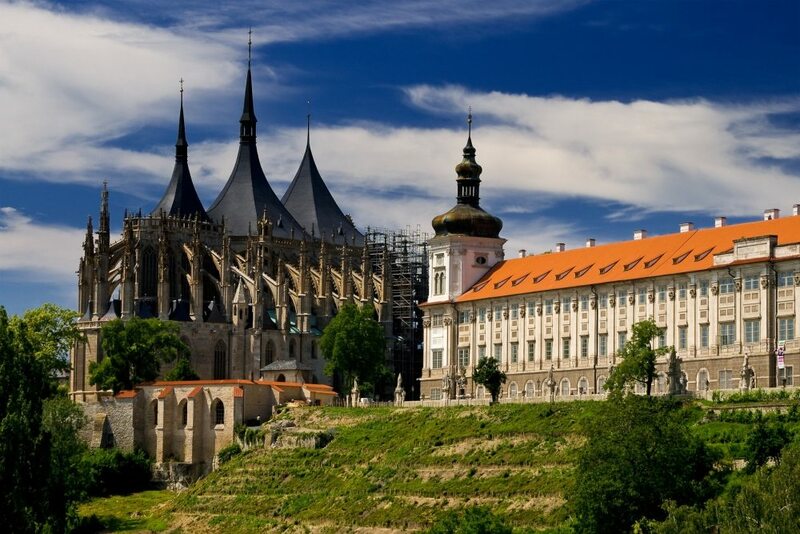 One of the most beautiful and historic cities in the known world is called Kutna Hora. Kutna Hora is situated close to the religious inspired Prague and has been called the most historic city in the Czech Republic. The city is often refered to as the silver city since the largest concentration of silver ore was mined from beneath the city. One of the great wonders of the city was the wooden pipes that used to run from the tops of nearby mountains delivering fresh water to stone fountains that line the city. One of the main attractions of the city is the Santa Barbra church constructed from the monies generated from the mined silver ore and named for the ancient saint of minors. When you enter into the church you will struck by all of the awe and wonder. First you will look and see that there is a large painted net vault that runs the length of its spacious interior. Also, as you gaze above you will see a three section tinted roof. Gazing at the construction of the church you will be amazed that the slender pillars can actually support the weight of the roof and has been an architectural mystery for centuries. As you continue your exploration you will find ancient pictures depicting the imagery of silver minors, coin manufacturers and even biblical scenes. The church is amazing with five isles and an assortment of different choir halls and service areas. The church is a welcomed house of warship for all to attend. From the thirteenth to the eighteenth centry the city was considered to be the most important city in the kingdom of Bohemia. In its prime the city was home to almost 100,000 minors drawn to the city for its promise of wealth and prosperity from silver. In fact, this city was so ripe with silver that over three million kilograms of silver was mined from around seven hundred meters below the ground. When we add this up this city produced at least one third of all the known silver in the ancient world. One of the attractions you can find in the city is the great museum. In the museum you will find a large circular conveyer wheel that was used by horses to extract silver ore from the mines. Now, visitors can wear protective clothing and enter into the mines where they will have a once in a lifetime tour of this ancient mid-evil world. Many historic buildings can be found within the city. One such building is the stone house. This gothic inspired building is home of many religious figures and leaders. Ancient records of the monastery’s construction can also be located here. Another curiosity building you can explore is the bone house. In the bone house you will find a crypt that has over 40,000 human skeletal remains that have been reconstructed into Macomb works of art. Many of these items will be chandlers and pyramids.